There are a myriad of ways of bringing vintage kitchen decor into your family living space. By selecting a few carefully chosen pieces you can transform your kitchen to evoke a truly individual style. Antiques also bring warmth and texture to a more contemporary kitchen whilst enhancing the rustic taste of a more traditional style. Antique fairs are a perfect place to pick up a vintage piece or try visiting your local vintage shop where you will benefit from the knowledge and expertise of the shopkeeper as well as learning the unique story behind each of your chosen items making them extra special. 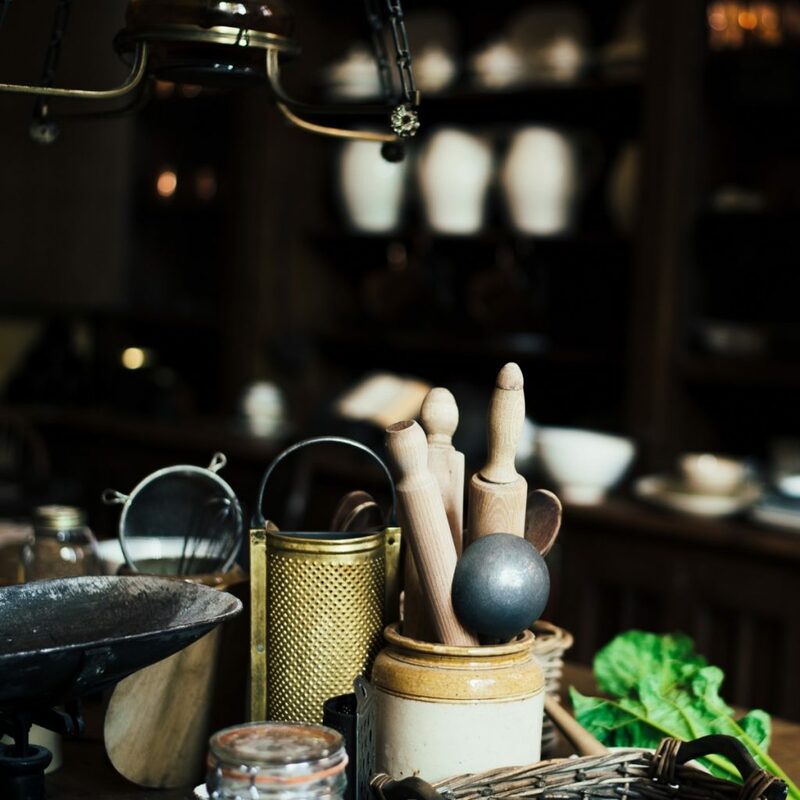 The Old Haberdashery in Ticehurst has a vast array of interesting and beautiful items ranging from the Victorian era to the 1970’s, it’s the perfect place to source some eclectic treasures for your kitchen and home. The appeal of the unique is ever growing and you can entertain your dinner guests with the provenance of your vintage finds. 1.Hungarian enamel containers were traditionally used for storing items such as oil, but are ideal for keeping potatoes, onions or even kindling. They will add a stunning pop of colour to your kitchen. 2. Vintage scales or iron shop weights look perfect in a more traditional kitchen. 3. Hungarian glass preserving jars are ideal for storing food and add texture and interest when displayed on a shelf or worktop. 4. Vintage crockery is a relatively cheap way to style your kitchen. Whether you’re after the soft 1920’s floral colours or the utility style of items from the 1940’s, there is something to suit everyone’s taste. 5. The last few years have seen a big resurgence in the use of copper, popular for adding warmer tones to your kitchen. You could display vintage saucepans or simply use copper hooks to hang tea towels or keys on. Or why not use copper piping to make taps or supports for shelving? 6. If you are feeling creative Hungarian linen can be used to make curtains or table runners. It’s a good quality, thick material that will last well. 7. Indian ladles made from iron create beautiful tea light holders when suspended from hooks on a wall. 8. Oversized French glass storage jars filled with string lights will add a festive touch at this time of year. 9. Why not upcycle fruit storage crates for shelving? This not only looks great but saves you money and is environmentally conscious. 10. Recycled industrial lights bring a retro feel to both modern and Shaker style kitchens. 11. A shelf with vintage tins will add colour and interest to a simple layout. 12. Add rustic open shelves to display your favourite and most useful items or cookbooks. 13. Use vintage recipients to store your cooking utensils in whilst enjoying the search for that special piece to complement your kitchen. 14. A rustic butcher style trolley is both aesthetically pleasing and functional, creating extra work surface space and storage. 15. An old wooden ladder can be upcycled to create a hanging storage rack for saucepans.